Under a yellow finish, Dario Franchitti leads Scott Dixon and Tony Kannan across the Yard of Bricks to win his third Indianapolis 500. 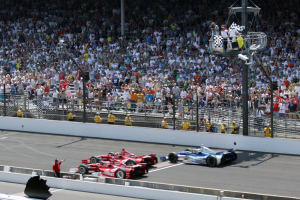 INDIANAPOLIS – On a day when all eyes seemed to be on the temperature gauge, in the end, they returned to the track to watch the new Dallara chassis cross the Indianapolis 500 yard of bricks for the first time as Dario Franchitti captured his third the Greatest Spectacle in Racing. Franchitti won the 96th running of the Indy 500 in record fashion, as the race saw 34 lead changes – breaking the previous race high of 31. But it was the final attempt at a pass that was the most thrilling. Shortly after taking the white flag, Takuma Sato attempted to pass Franchitti on the low side of Turn 1, but lost traction and spun, narrowly missing Franchitti before smashing into the short shoot wall nose first. Franchitti would win under caution, while teammate Scott Dixon finished second and good friend Tony Kannan third. “I moved over and I saw he was coming,” said the three-time milk drinker. “I came back over and I moved up the track. He got loose underneath me. It kind of reminds me of Emerson (Fittipaldi) and Little Al (Unser) at the end there. Franchitti said three-time Indy 500 champion Johnny Rutherford had presented him a copy of his book, which he read this week. For the complete story, see the May 29 issue of the Sports Journal of Central Indiana. And don’t miss Photo Editor William Gibson’s sensational picture of the Sato spin next to Franchitti. This entry was posted in Indianapolis, Indy 500. Bookmark the permalink.